Things at work have been a little hectic lately, and with long days spent behind my laptop I’ve been unenthusiastic about spending even more hours working on the blog. We did really love Marina Chiapas in Huatulco, though, and I’m finally getting around to writing about it. A great community. Huatulco is just north of the Tehuantepec in Mexico, which means that people have either just crossed it or they are waiting for a weather window. It makes for an interesting dynamic, where you’ll post up with a group of boats for a little while and then many of them will leave in the same 2-3 day stretch when the wind and waves look ideal. This means that we really got to know some of our neighbors – we had a super fun bonfire and beach potluck, plus a few rounds of drinks on various boats. 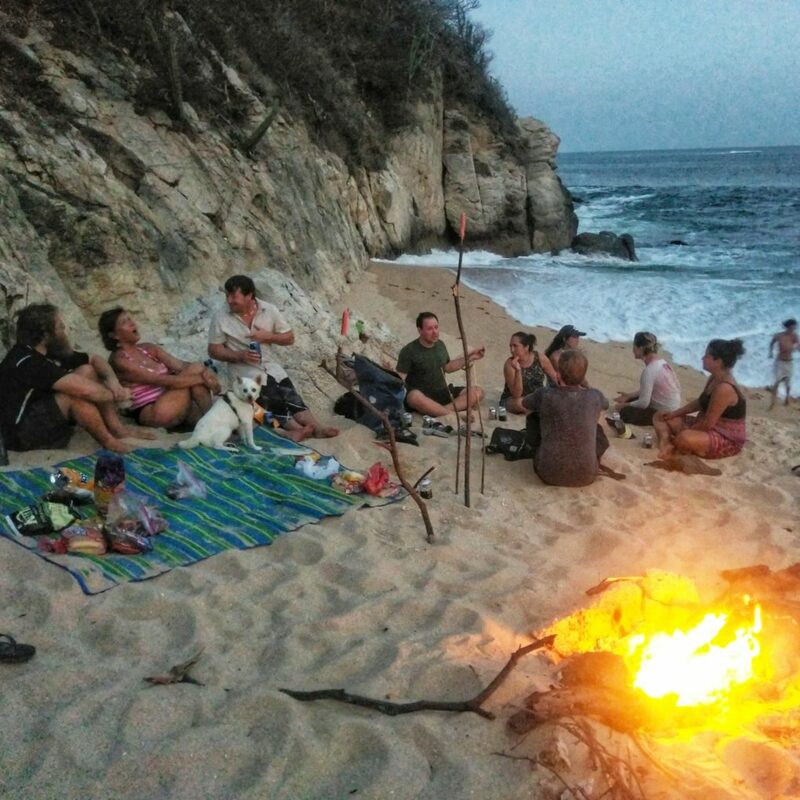 We had a great turnout for our bonfire on this secluded little beach. Lots of space to exercise. There were tons of trails and wide sidewalks, so Philippe and I got back into a morning exercise routine. There was also yoga 2x / week and a small fitness center that was within walking distance. After our time at anchor, easy access to land and exercise was so nice. 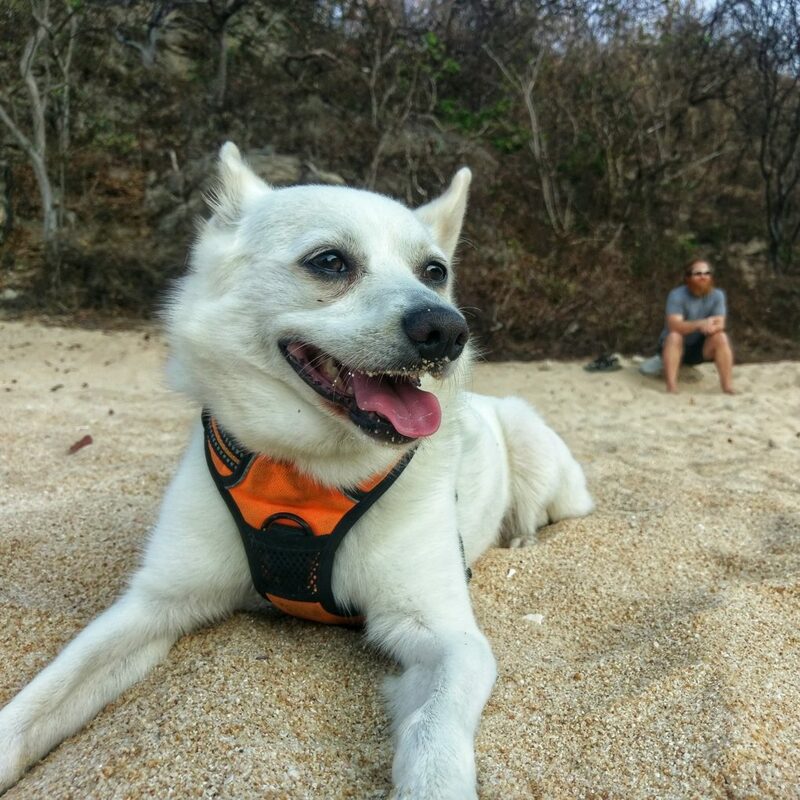 Yuki and Philippe taking a rest on the beach after some playtime. Philippe and Yuki enjoying the view after a run. Super safe. One of our cruising friends had been asked by another cruising friend to check out their boat while they were away. She stepped aboard to check the cockpit, and immediately a guard ran over to her and demanded she get off the boat. We haven’t seen security like that at any other marinas in Mexico – they patrol 24 hours / day and are in full police gear. Even without them, it would have felt safe, but having them present was an added bonus. Wilderness. We got to go on a number of hikes, which was awesome. We haven’t done much hiking in Mexico, but the Huatulco National Park has a few trails that are easy to access. The area is beautiful, with sloping hills and lots of trees, and we almost never saw another person on the trails. Philippe and I aren’t birders, but the sheer abundance of calls and colors that soar through the trees is unreal. We found some hiking access to this incredible beach with rock formations. This suspension bridge runs over a river bed in the national park. Surge – The marina has a ton of surge, so Untangled would bounce around a lot and our lines were constantly at risk of chafing. We were in a slip that was closest to the exit, but with a dock on either side (so we pulled into the marina, turned down a fairway, and docked in the very last slip of the fairway). It was super tight trying to get into and out of the slip, but luckily we had plenty of helping hands. Unfortunately, our slip collected a few inches of thick, brown sludge every morning. We’d had the bottom cleaned in Zihua, so it was really disappointing to see the brown froth collecting on the bottom of Untangled every morning. Marina bathrooms. In general, the marina facilities left a little to be desired. Many of the docks and cleats were in rough shape, although they are supposed to be replacing them soon. The showers are outside. The strangest thing of all, though, was the bathroom. There were two bathroom stalls: one for men and one for women. They were located right next to the security guard post, where a bunch of men (workers, fishermen?) always sat. And you had to take your toilet paper before entering the restroom. So you would walk up, say hello to all these men, choose your toilet paper amount, and then go into the bathroom with only a flimsy door between you. Cell phone connectivity – Cell connectivity was fine. Wi-Fi – Internet could be a little spotty, but there were some options. The marina offers Wi-Fi, which was good 60% of the time. The rest of the time we relied on signals from some of the restaurants, but most of them turned their networks off when they closed. My Verizon hotspot also worked well to fill in the gaps. Restaurants – Cafe Juanita is a clear favorite of the cruisers and the gringo community. The owner, Jane, is Canadian but has lived in the area for over two decades. She runs some cooking classes, hosts the donation-based morning yoga 2x/week, and edits The Eye (Huatulco’s gringo magazine). Philippe and I also really loved Rocoto. The food was great, but the service was even better. There are only a few tables. The chef, Claudia, came right over and told us all about her menu and her specials. She has such a clear passion for her food and is so excited by the things she creates. It was a really fun (and delicious) experience. Coffee – Niko’s Organic Coffee is the spot! They have a cute space and a great vibe. Admittedly, I didn’t drink any coffee, but I’ve heard it’s delicious. They food is really good. We made friends with the owners, and they really put a lot of love into this place. They spend a lot of time shopping for high-quality, fresh ingredients. Definitely check this place out. Things to do – We can’t recommend the national park enough. We couldn’t believe that on our 4-hour hike we only saw one other person at the very beginning of the trail. Most of the park is beach, but we loved waking up early and exploring the trails in the forest. There’s super easy access to a hiking trail with a suspension bridge right down the street from Hotel Binniguenda (map). Glad to hear from you. Ken was just asking if I had heard anything. Hope all continues to sail easily. It looks like you are having a great adventure. Did you stop in Honduras? Keila lived there for a year before getting married. Muriel, Keila and I spent some time on Roatan a few years ago. It’s a Beautiful place too. Continue to enjoy your adventure. We didn’t stop on the way south, but we might stop on the way back up. Glad to hear you loved it!